Bruin Basketball Report | UCLA Bruins Basketball: Cedric Bozeman, Bruins "Point Forward"
Cedric Bozeman, Bruins "Point Forward"
Rewind to the beginning of last year. 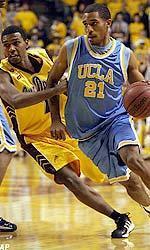 Howland had just anointed senior Cedric Bozeman as the starting point guard for the Bruin 2004-05 squad despite the fact that Bozeman's previous three years at UCLA had been rather unspectacular, and perhaps in some minds, somewhat disappointing. Just before the season was to begin, Bozeman injures his knee and decides to red-shirt his senior year. Rewind further three years back. When highly recruited from high school, Bozeman was expected to step into the Bruin line-up and follow in the line of UCLA star point guards - Earl Watson and Baron Davis had just preceded him and were playing in the NBA. Unfortunately, Bozeman hurt his knee before the start of the season and when he did return, Bozeman was not able to keep up with the quicker Pac-10 point guards defensively, and just as disquieting for fans, Bozeman couldn't hit from the outside if his life (career) depended on it. Now a fifth year senior. Bozeman is no longer the team's point guard - sophomore Wooden award nominee Jordan Farmar backed by freshman sensation Darren Collison are now the team's point guards. Bozeman is now playing the small forward spot - a position he would have battled Josh Shipp for playing time. However with Shipp rehabilatating from offseason surgery, Bozeman was given the starting position almost by default. Injuries can lead to misfortune and opportunities in sports. In Cedric Bozeman's case he has experienced both. Bozeman has sparkled in every Bruin game in the young basketball season. His experience and leadership, on a team with predominately freshmen and sophomore and ravaged by injuries, has been welcomed by both his teammates and head coach Ben Howland. Howland recently commented after a game, "he's (Bozeman) played a lot of games for us and he knows what to do". Howland has especially been impressed with Bozeman's "tough play" this year in particular his defense and rebounding. Bozeman has played solid man defense usually guarding the opponent's best scorer; the team's second best rebounder, his outside shooting (4-7 three-pointers), and has passed - well, like a point guard. Bozeman has literally redefined his role on the team - he is the team's "point-forward", a role which fits Howland's up tempo, fast breaking team perfectly. Usually when a Bruin player grabs a defensive rebound, Howland demands he immediately looks for Jordan Farmar for an outlet pass. However when Bozeman rebounds, he has the green light to push the ball up the court for fast break opportunities. It has helped relieve some pressure off Farmar, and it also has created the easy type of scoring chances Howland plans to have his team capitalize on this year. Bozeman's senior leadership and improved play is a key ingredient to the Bruin's success this year. This squad has a talented corp of freshmen and sophomores; however, when tournament time arrives in March it will help to have a senior leader on the floor. If the Bruins expect to advance deep into the tournament this year then much of their success will depend on the play of Cedric Bozeman.